Pyar Kiye Jaa is my favourite film starring Shashi Kapoor and I think he’s at his absolute Shashilicious best here. It’s a very funny comedy with a couple of romances thrown in for good measure and a fantastic star cast. Sridhar takes the opportunity of a plot line involving making a movie to poke gentle fun at the film industry as well as relying on more conventional comedy scenes and the excellent comedic talents of his stars to make this a very entertaining film. Great songs, funny dialogue, excellent performances and plenty of dramatic Shashi Kapoor – what more could you possibly want? I didn’t realise until recently that Pyar Kiye Jaa is a remake of the 1964 Tamil film Kaadhalikka Neramillai which was also written and directed by C. V. Sridhar. Rajashree starred in this original version as well and reprised her role in the Telugu version Preminchi Choodu the following year, so I hope she enjoyed the role! One apology as well – I’m sorry the screen caps here are so blurry, but my DVD copy of this film is really poor quality. The film opens with a song where Shyam (Kishore Kapoor) and Malti (Kalpana) dance along the beach in a last meeting before Shyam heads back to work for his rich father Devraj (Chaman Puri) and Malti leaves Mumbai to go home with her sister Nimala (Rajasree). Malti and Nimala are the daughters of Ramlal (Om Prakash), the owner of Ramlal estates and the employer of Ashok (Shashi Kapoor) who just happens to be good friends with Shyam. All that in the first 20 minutes! But these first few scenes effectively set up most of the main characters, their relationships with each other and their social standing which leaves us free to concentrate on the mainly very funny comedy. It’s an excellent way to open the film and this first song is very catchy and upbeat with great moves by Kishore Kumar. Ashok has a run in with Malti and Nimala when he crashes his wreck of a car into their vehicle. Despite his winsome smile, the sisters are not impressed and once they get home demand that their father sack Ashok immediately. To his credit Ramlal is reluctant to fire someone he thinks is a good employee, but he cannot stand up to his daughters’ persuasions and has no choice but to go ahead and dismiss Ashok. Unfortunately for Ramlal, Ashok knows his rights and is not about to take his dismissal lying down. He sets up a rather magnificent striped tent opposite Ramlal’s house and armed with a set of expressive signs sets about protesting and demanding his job back. His next step is to hire a band and some supporters which leads to this wonderful song. This is the ‘best Shashi song ever!’ for me and nothing can beat Shashi’s gyrations as he demands his job back and berates Ramlal while Malti and Nimala fling buckets of water at him. His support crew groove away in the background and the band rather wisely keep well back to avoid the deluge. The Tamil version from the original film is almost as good and is filmed at exactly the same location, but I have to say that I think Shashi beats Ravichandran in terms of cuteness and the Hindi song is has a bit more pep as well. Meanwhile Ramlal’s son Atma (Mehmood) has set up a film production company named vah vah productions in the hope that this will be the audience reaction to his films (although my sub titles call it wah wah productions, which has a totally different meaning and may in fact be more accurate!). He’s relying on his father to bankroll his first production but Ramlal is rather slow at handing out any money. So vah vah productions at this stage consists of Atma as director, producer, screenwriter and everything else besides. Atma spots the beautiful Meena (Mumtaz) as she’s walking home and decides she would be perfect for his heroine despite her lack of acting talent. After witnessing Ashok’s rhetoric as he protests outside the house, Atma engages Ashok as his scriptwriter and the scene is set for a number of possible storylines to be explored. These scenes may be where Farah Khan got her inspiration for Om Shanti Om as Sridhar does an excellent job of sending up the film industry including some wonderfully bad dialogue delivery and acting by Meena and many clichéd scenes described by Atma. These culminate in Atma’s final description of his film, which has been a tragedy and a romance in previous incarnations, but has morphed into a ghost story as he relates it to Ramlal. 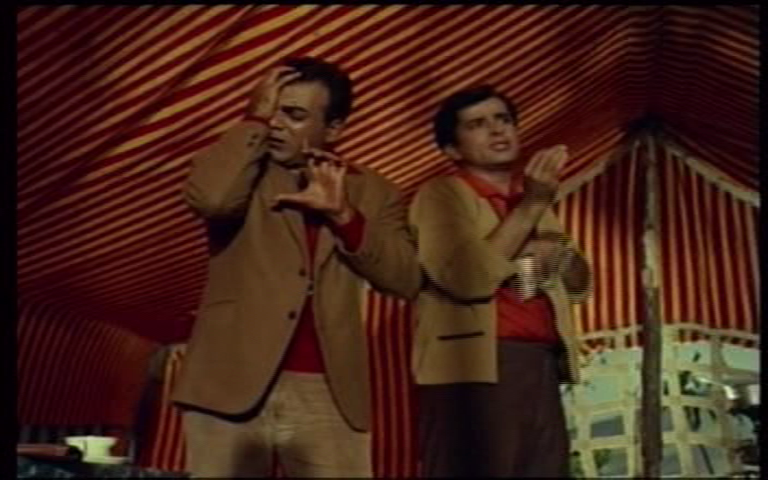 Atma adds in appropriate sound effects and the combination of Mehmood’s voice and Om Prakash’s facial expressions is both brilliant and hilarious. Meanwhile, Ashok and Nimala have patched up their differences and fallen in love. After all who could resist Shashi when he starts to strip off to jump into a canal in a daring recue of a transistor radio? The couple know that there is no way Ramlal will consent to their marriage and Ashok has to come up with a cunning plan. For this he needs his friend Shyam, plenty of make-up and Devraj’s Chevrolet car, which Ashok hopes will make the right sort of impression. Relying on his friend’s good nature Ashok persuades him to act as his rich millionaire father to win Ramlal’s approval for the marriage. Atma also takes the opportunity to try and solicit more funding for his film from the visiting millionaire, which means another great song. The plan is working well up until Devraj happens to come to the area to look at some property. He meets his old friend Ramlal and decides that Malti would be the perfect match for his son. So Shyam has to find a way to be both himself and Ashok’s father and explain why the eccentric millionaire Mr Raibahadur Ganga Prasad is driving his father’s car. It all works out in the end of course, but not before Shyam and Ashok have to concoct various other tall tales and even end up in jail. I love this film, partly because Shashi is fantastic and totally irresistible, but also because everything comes together perfectly. It’s a well written film where the story flows consistently and the comedy is cleverly integrated into every scene. The plot devised by Ashok requires constant revision as events unfold, and Shashi’s character is funny as well as resourceful and inventive. Despite his con-artist ways, Ashok is so engaging and charming that it’s possible to forgive him for lying to his potential father in law. This is helped by the fact that he confesses all to Nimala early on and she’s equally happy to hoax her father to get what she wants. Kishore Kumar plays a great straight man to Shashi’s Ashok and his performance as the pompous and eccentric billionaire Raibahadur Ganga Prasad is superb. Shyam enters in to the deception with some reservations, but is unable to resist Ashok and then makes the most of his disguised . Both Rajashree and Kalpana are good in their roles although they intermittently seem to be wearing so much make up that it’s amazing they can move their faces at all. Neither character is reluctant to stand up for what they want and they both are strong and determined women. They both look beautiful in the songs and in the later romantic scenes and I like the way the two different romances develop. Mumtaz only has a small role as Meena but she is funny as she tries to follow the instructions given to her by Atma and she is very good at being a bad actor! Mehmood is on top form as the wannabe director with plenty of wonderful expressions and Om Prakash is excellent as the rather hen-pecked Ramlal. 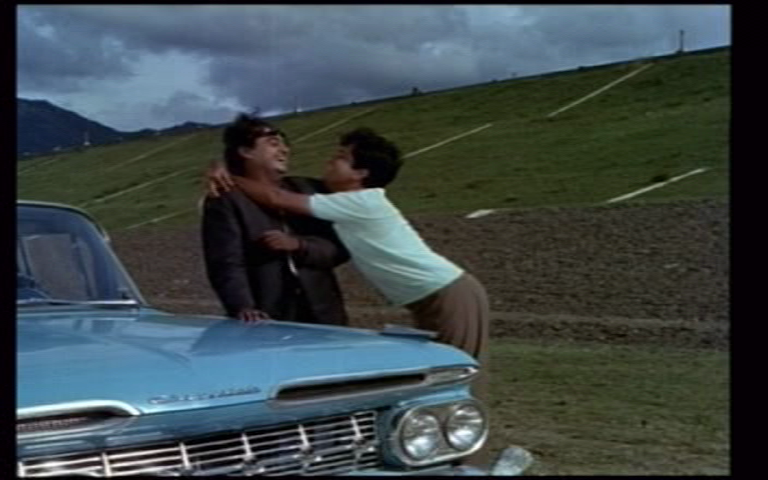 Another major plus of the film is the fantastic music by Laxmikant and Pyarelal. All the songs are well placed and each is utilised to develop the story further. Everyone gets their chance to shine and there is a song here for every possible occasion. I love every single one and it’s been very difficult to decide which to add in here. I just wish the quality of the film was better, since there are many places where black spots and lines appear, and that my copy had subtitled songs. 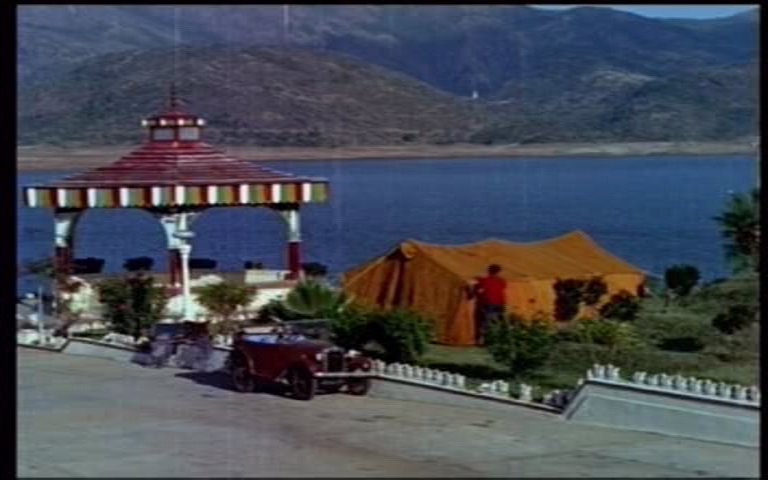 Otherwise there is nothing I don’t like about this film – it’s perfect Shashi Kapoor fare and a real classic. 5 stars. I do love Pyar Kiye Jaa but I have to say it edges towards my maximum tolerance for slapstick and silly disguises. Heather has described the plot in some detail but it isn’t the story as much as the actors that I enjoy. There is something in the dynamic between the male stars, a balance of energies, that is very pleasing. 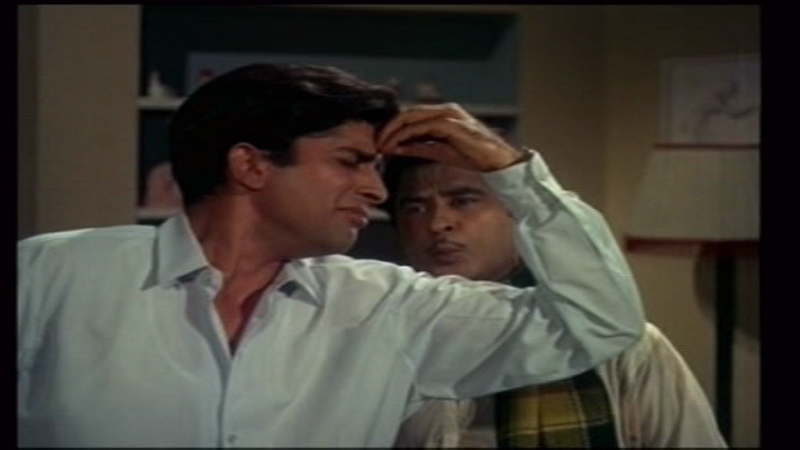 Shashi seems to be having a ball, playing the filmi hero and making sure his performance is appreciated – mock fainting in distress and surreptitiously checking how his audience react before swooning a bit more. Of course he is also the perfect clean cut romantic lead which doesn’t hurt in a fluffy love story. 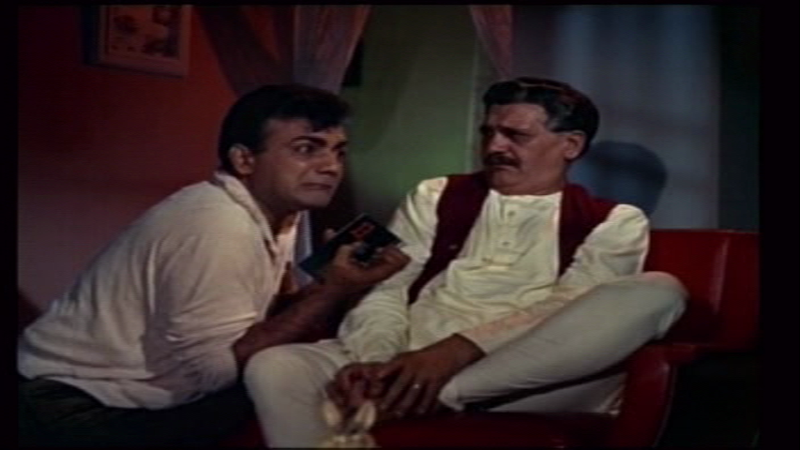 There is an extra sparkle in Shashi’s eyes when he and Mehmood are sending up their own industry. 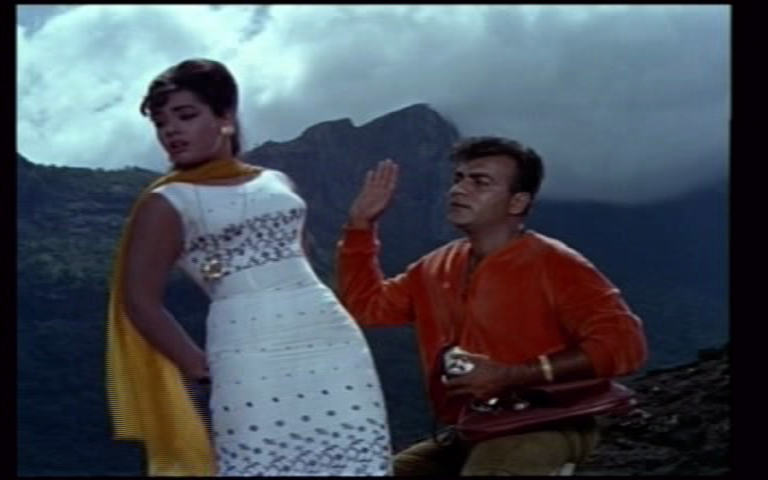 Mehmood’s Atma is strangely reminiscent of Tony Curtis with his quiff, terry-towelling leisure wear and Capri pants. Mumtaz brings a squeaky exuberance to Meena and is the only memorable female cast member for my money. There is such a thing as too much Mehmood, and sometimes even too much Kishore Kumar, but good writing and well matched performances avoid that pitfall. Laxmikant-Pyarelal excel at the swinging big band style. This soundtrack stands up really well without the visuals, and is even more fun with them. Kehne Ki Nahin Baat is just the best unfair dismissal protest song ever (and has Beth’s vote for greatest song in the world). There are a few negatives – a bit too much slapping, stalking and shouting in some ‘comedy’ scenes and a very unsurprising plot. But see it for the charm and good humour of the cast, and some stylish retro rom-com fun. 4 ½ stars! This entry was posted in Bollywood and tagged C V Sridhar, Chaman Puri, Kalpana, Kishore Kumar, Laxmikant-Pyarelal, Mehmood, Mumtaz, Om Prakash, Pyar Kiye Jaa, Rajasree, Shashi Kapoor. Bookmark the permalink. I agree with you about Shashi’s dancing – he really suited these songs and looked fantastic the whole way through. I really wanted to add in all the songs! The one with Rajasree in her bedroom after she realises she has fallen in love is another favourite. So many good songs! I haven’t actually seen this movie yet, but I love the music from it. I really should see it, as it’s full of the kind of 60s cigarette-pantsed goodness that I adore. Plus of course Shashi, Mehmood and Kishore Kumar are all at their best. It’s such a fun film!